Today we are joined by His Hermeneuticalness, Fr. Timothy Finigan, of Blackfen, England (fl. 2008). He speak with me in an interview about the recent conference held in Oxford at Merton College for priests wanting to learn about the Extraordinary Rite and about the celebration of other sacraments. The audio of interview was made with a skype to landline call, and so I had to work with the audio a bit to get the balance something close to… well… balanced. I’m hopeful that in the future I will learn to do this better. Also, we have another installment of stories about the fictional don Camillo Tarocci, (+ A.D. … ?) parish priest of "The Little World" created by Giovanni Guareschi. 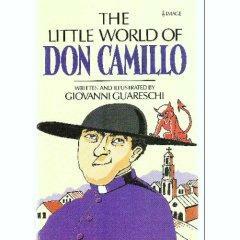 I began a new project in PODCAzT 66 (continued in 67), namely, to read stories from The Little World of Don Camillo. At this point, some thousand or so of you have listened. These delightful pieces are set in post-war Nothern Italy. They blend brilliant insight into the human condition with solid applied Catholic Faith. The iTunes feed is working again… mysteriously. Check it out! This entry was posted in don Camillo, PODCAzT, SESSIUNCULA. Bookmark the permalink. I love Don Camillo and Don Finigan! Keep up the Don Camillo stories Father! More Fr. Tim and more Don Camillo. Wonderful. Thank you, Father, for all your work in producing this PODCAzT. It’s very much appreciated. Hmmm, its not showing up on my iTunes feed.